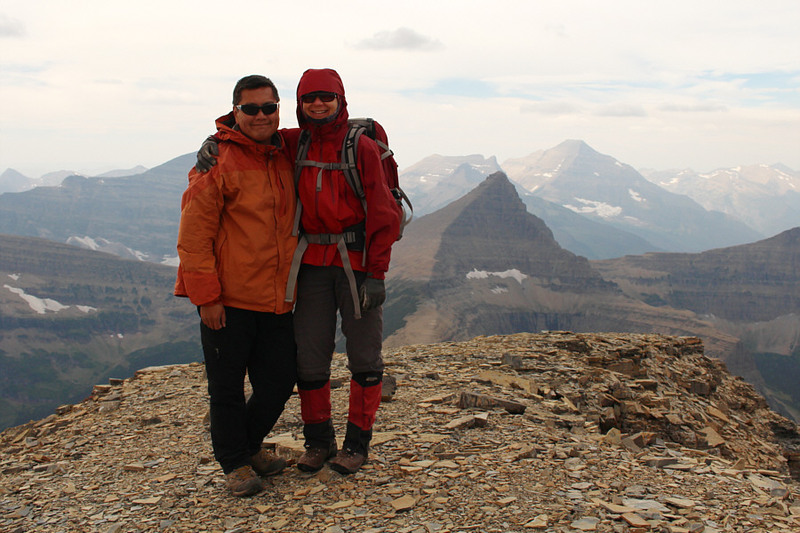 Taking advantage of free entry into Montana's Glacier National Park because of National Park Service Birthday celebrations, Zosia Zgolak and I visited the Two Medicine area on 27 August 2016 to climb Rising Wolf Mountain, Flinsch Peak and Mount Helen. After camping just outside the park the previous night, Zosia and I got up before dawn and drove to Two Medicine picnic area to eat breakfast before heading to the trailhead at the far end of the nearby campground. 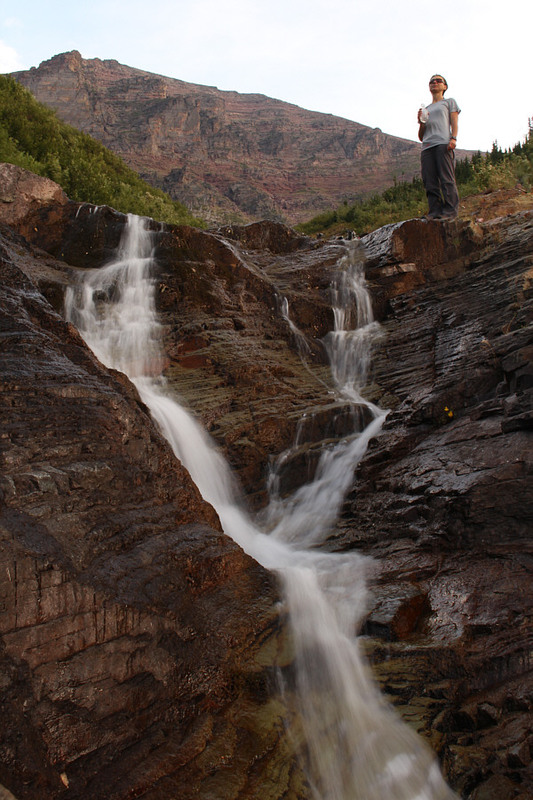 From there, we crossed the bridge over Two Medicine Creek, and almost immediately, we turned left at a junction to follow the trail to Dawson Pass along the north shore of Two Medicine Lake. 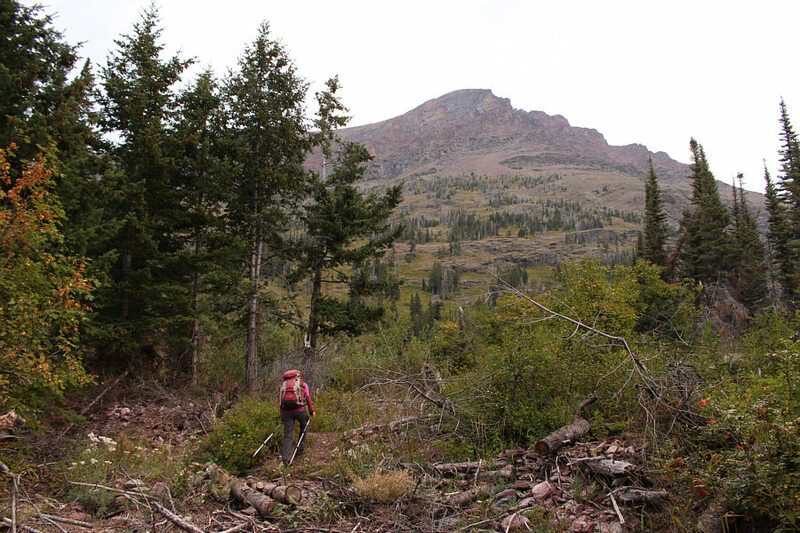 My original plan was to leave the trail and ascend a drainage which grants access to the east ridge of Rising Wolf Mountain. 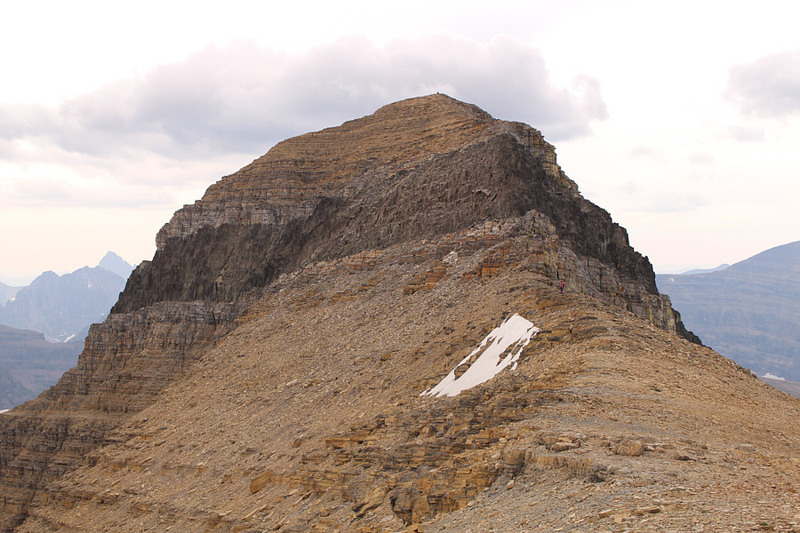 We would then traverse over the summit and follow the connecting ridge to Flinsch Peak before dropping down to Dawson Pass. 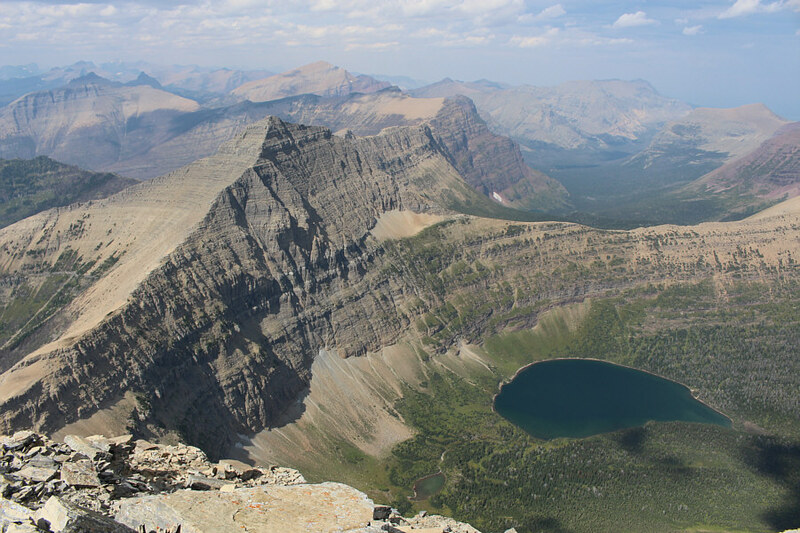 If we had enough energy left, we would also climb up Mount Helen on the south side of Dawson Pass before returning via the same trail we started on along the north shore of Two Medicine Lake. There are actually two obvious drainages that descend from the southeastern slopes of Rising Wolf Mountain, but I had a difficult time reconciling the route description that I had pulled from summitpost.org with what I saw first-hand up either drainage. After some backtracking along the trail and a false start up the first drainage, we settled on ascending the second drainage further west. In retrospect, either drainage would probably work, but we quickly dispensed with the somewhat confusing details of the summitpost.org route description and simply did our own route-finding up the second drainage (this second drainage is the one that is briefly referred to in A Climber's Guide to Glacier National Park by J. Gordon Edwards). 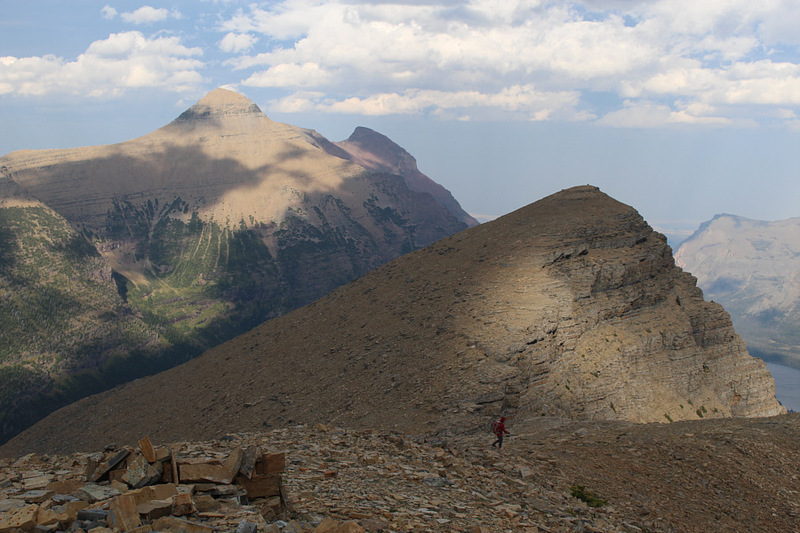 Other than one short stretch of bushwhacking, our ascent up the drainage was fairly straightforward. 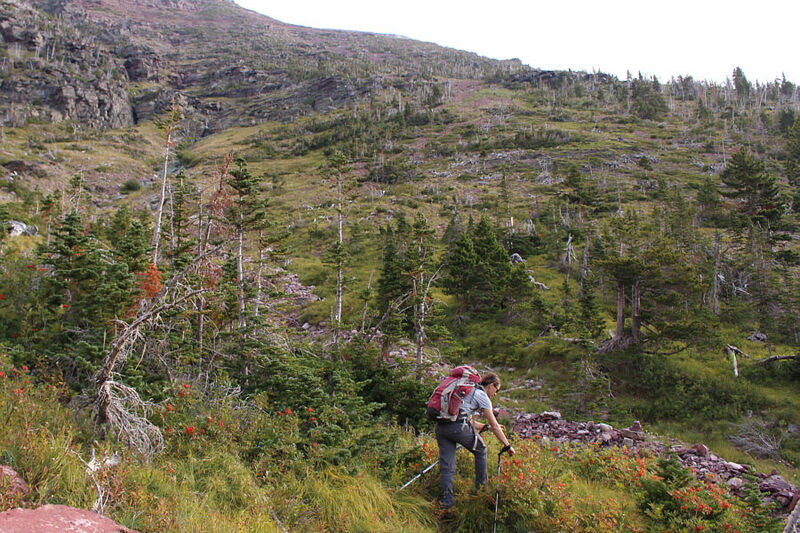 Higher up, we veered over to climber's right onto lightly treed slopes of red argillite and eventually gained the crest of Rising Wolf Mountain's east ridge. 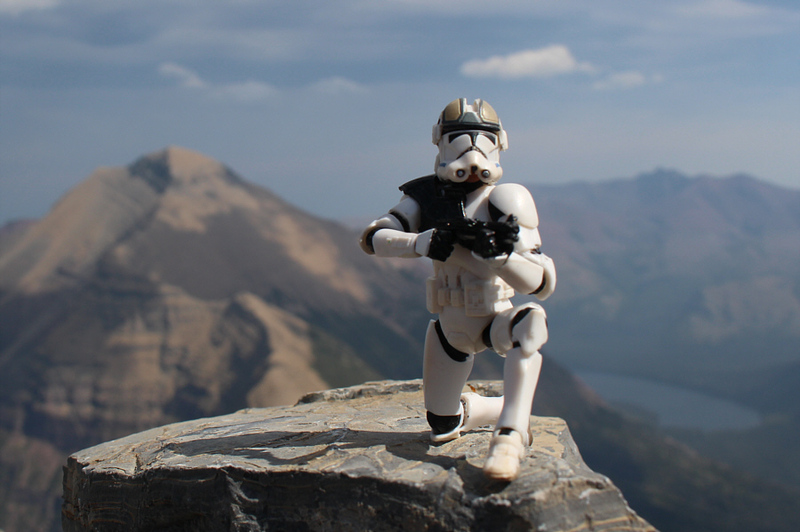 We took a short break here before hiking toward Rising Wolf Mountain's summit block which is guarded by a distinctive black band of volcanic rock known as the diorite sill. Without any lingering snow, the diorite sill was quite easy to scramble up, and we had no problems reaching the summit shortly after. Zosia heads up the first drainage but would soon turn around. Zosia heads up the second drainage further west. 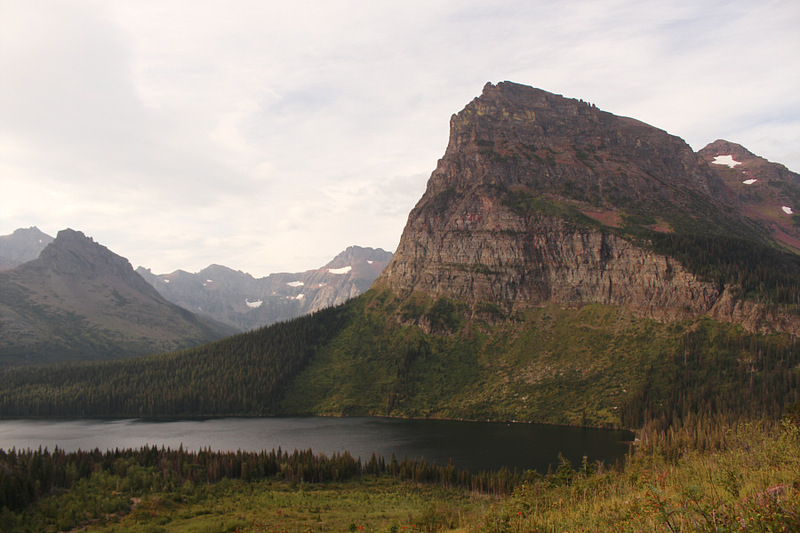 Sinopah Mountain towers above Two Medicine Lake to the south. Zosia stops to drink some refreshing water. The cairn at bottom right is a good indication that Zosia is on the right track. 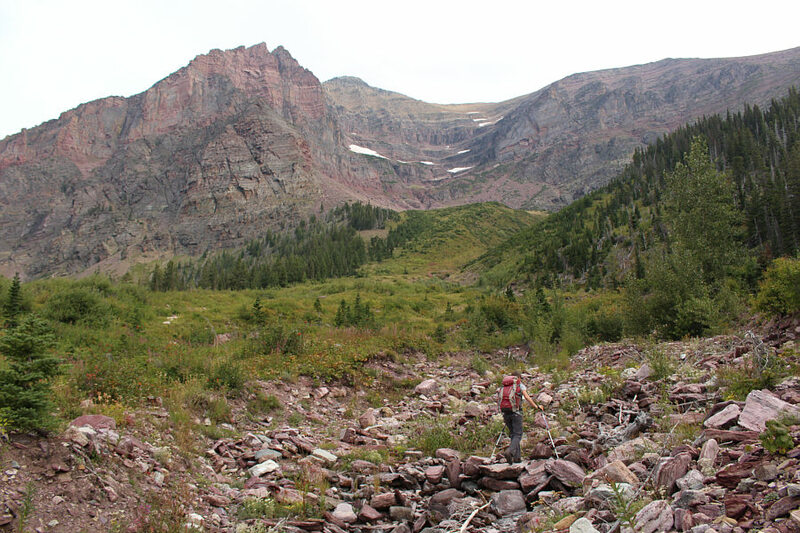 She would eventually head for the red argillite slopes at the top of the photograph. 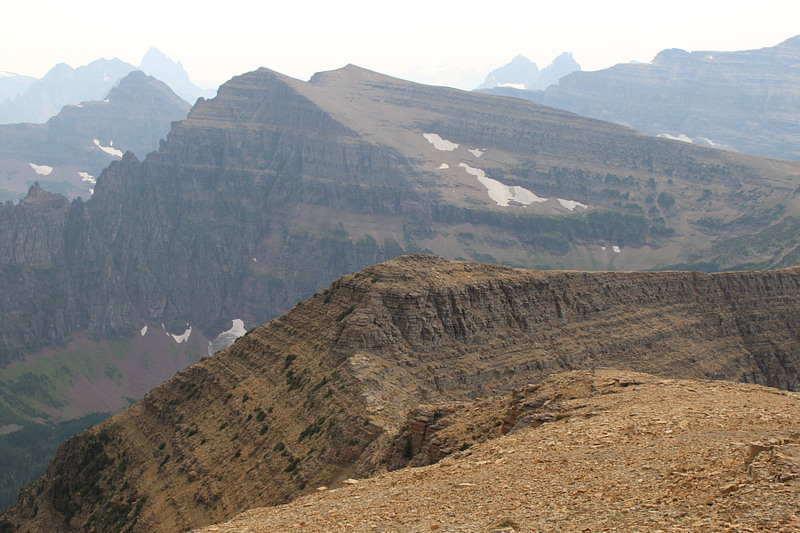 Zosia ascends the east ridge of Rising Wolf Mountain. 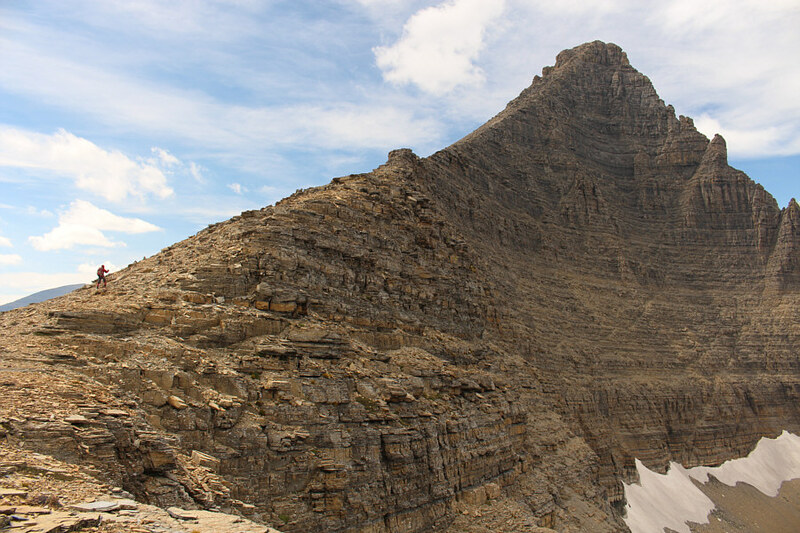 The summit block of Rising Wolf Mountain is guarded by the diorite sill. 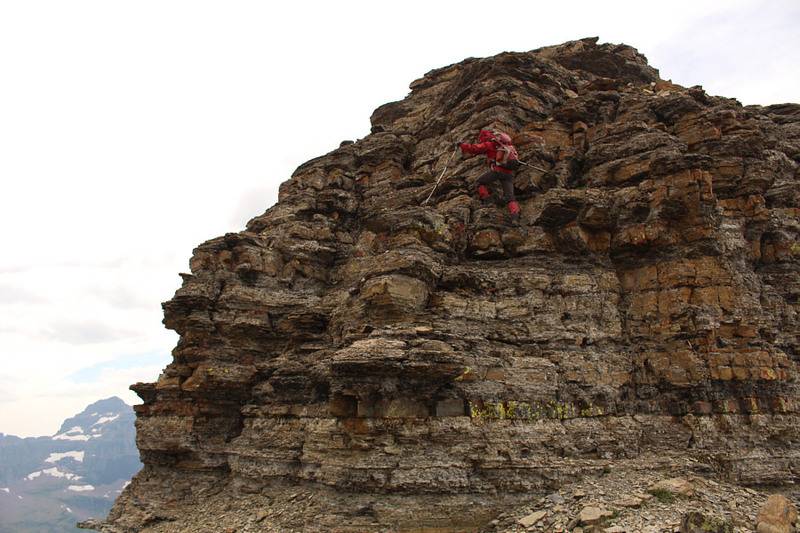 Zosia tackles the diorite sill with verve. 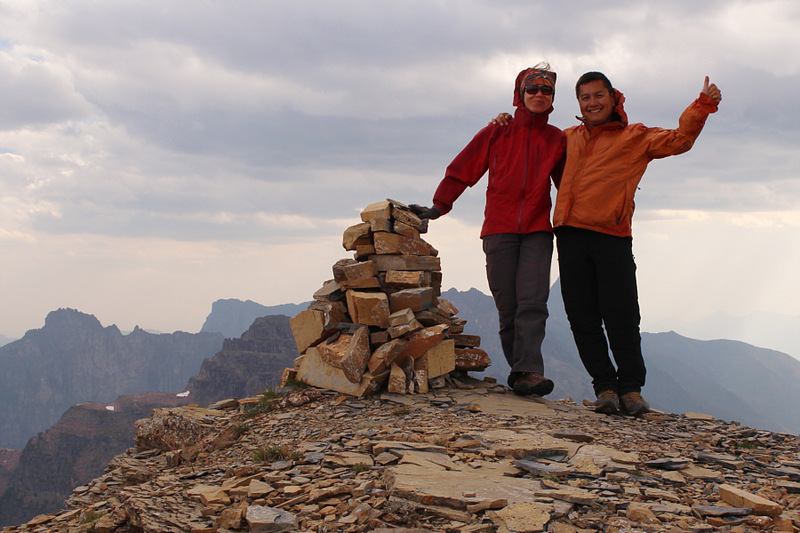 Sonny and Zosia hold onto each against a stiff wind on the summit of Rising Wolf Mountain (2894 metres). The entire Scenic Point Loop can be seen to the southeast. 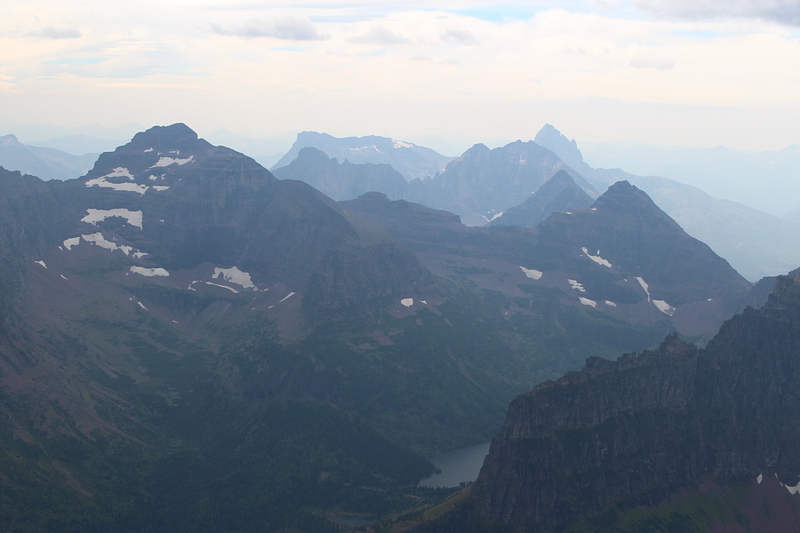 Among the many peaks visible to the southwest are Mount Rockwell (left) and Mount Saint Nicholas (right horizon). Also visible is a small part of Upper Two Medicine Lake. 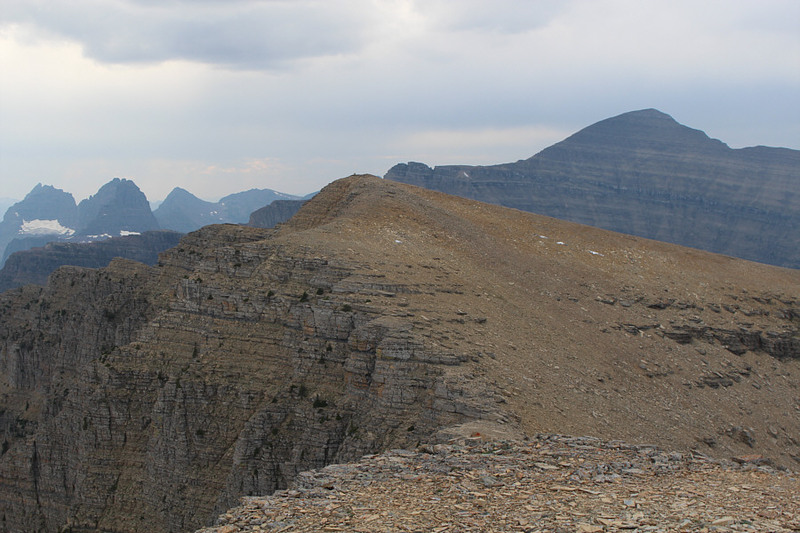 A brisk wind shortened our stay atop Rising Wolf Mountain, and we quickly descended a well-worn path on the west side of the summit block. 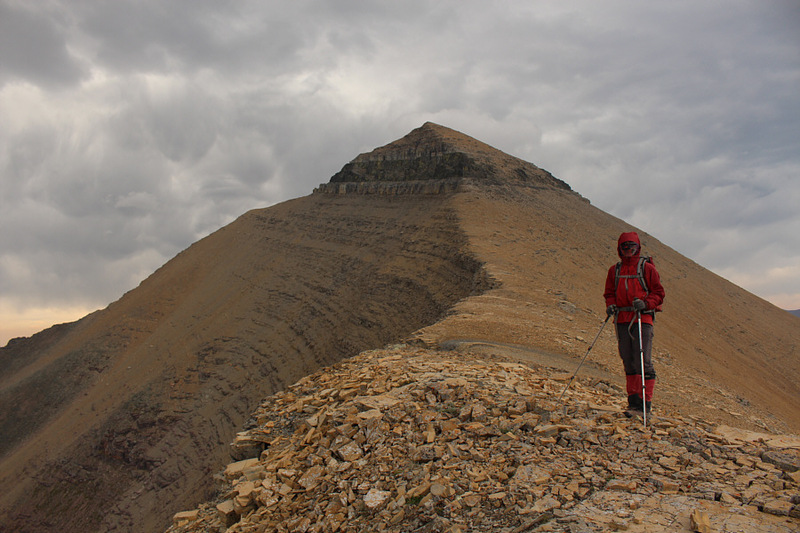 We continued westward along the connecting ridge to Flinsch Peak, and the only difficulty along the entire traverse is a mildly exposed down-climb near the low point of the ridge. As the day progressed, the wind strengthened considerably, and we struggled at times to keep our balance. Zosia complained about the wind literally taking her breath away, but that hardly slowed her down as far as I could tell. Zosia zoomed out well ahead of me, but she then waited for me to catch up before we took the last few steps together to the summit of Flinsch Peak. 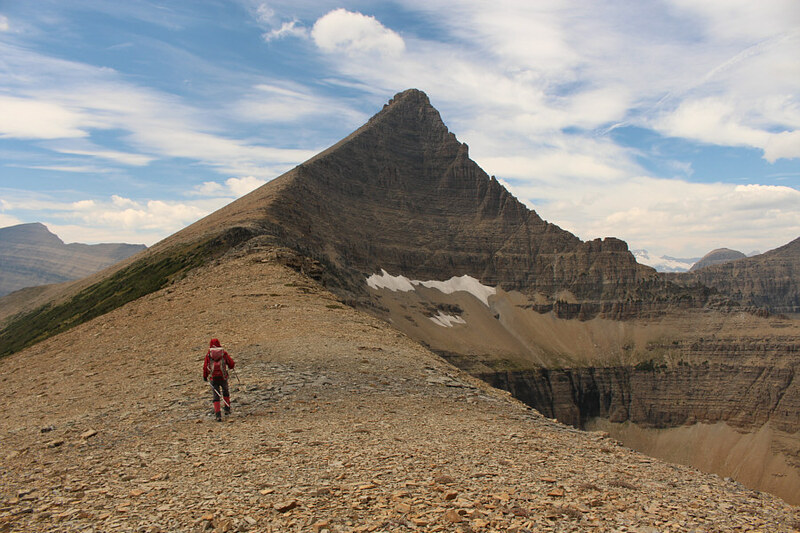 After a marginally longer summit stay, we followed cairns down the southwest side of the peak and descended without problems to Dawson Pass. 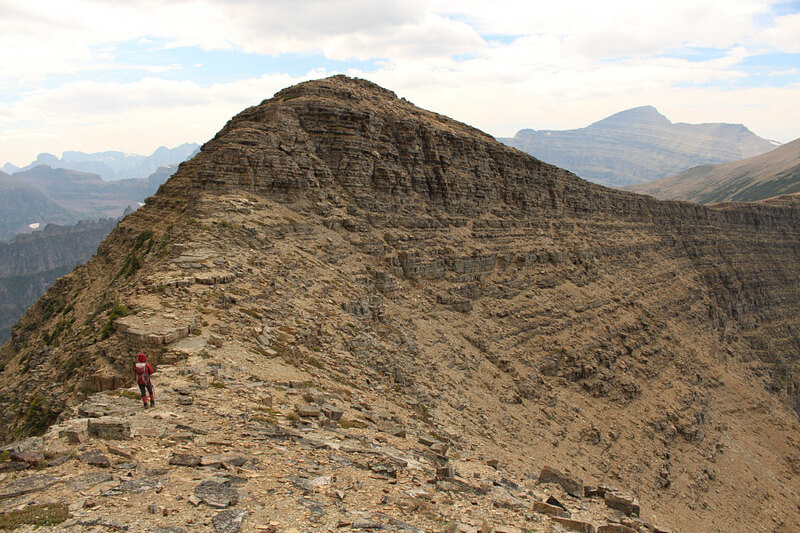 The connecting ridge can be followed all the way to Flinsch Peak (left). 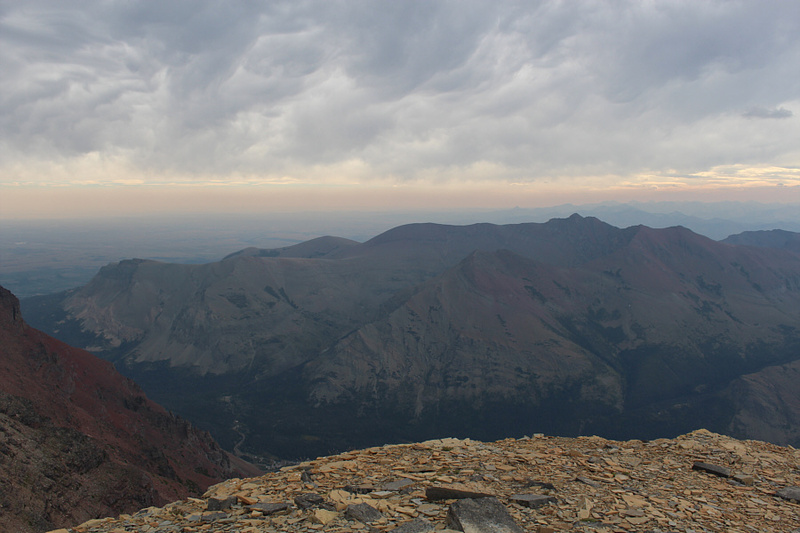 Also visible are Mount Phillips (far left), Mount Stimson (behind Flinsch Peak), Mount Morgan (right) and Oldman Lake. While descending the west ridge of Rising Wolf Mountain, Zosia wears a scarf over her face to protect herself from the wind. Young Man Lake is revealed below the east face of Flinsch Peak. 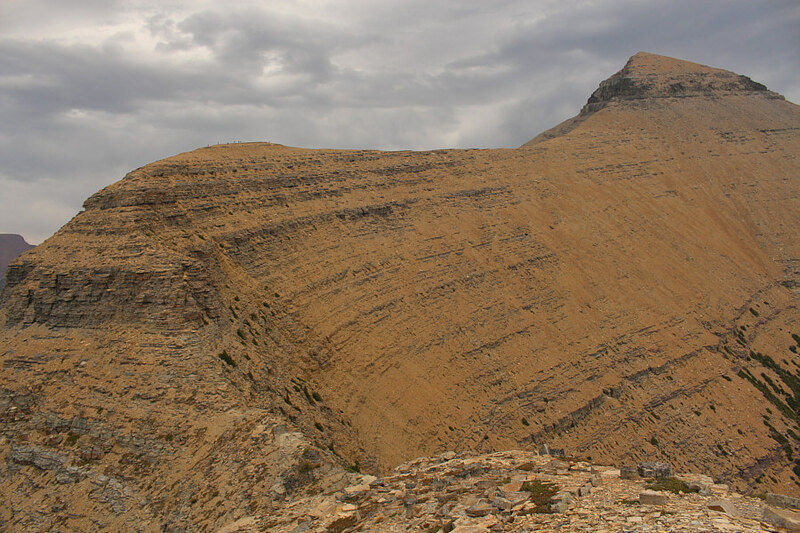 Ahead is the low point of the connecting ridge between Rising Wolf Mountain and Flinsch Peak. 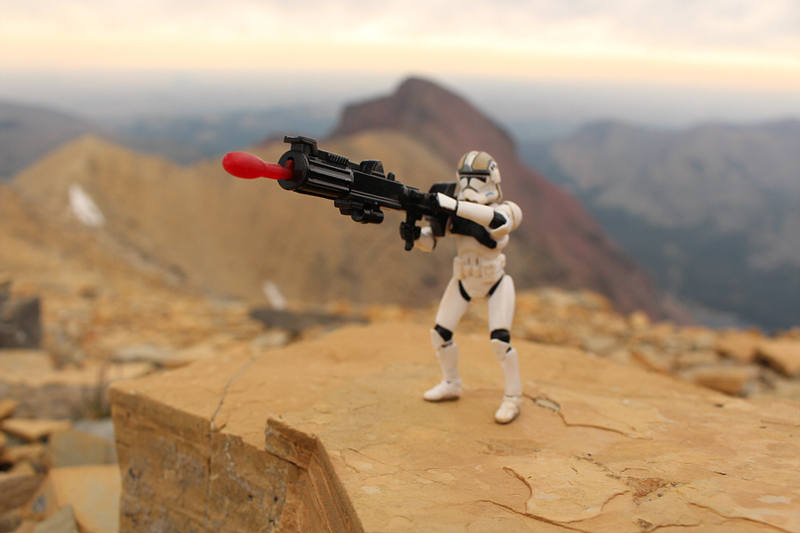 Mount Helen dominates the background. Sonny descends Class 3 terrain near the low point of the connecting ridge. Zosia traverses the low point of the connecting ridge. Zosia expertly scrambles up the hump on the southwest side of the low point. 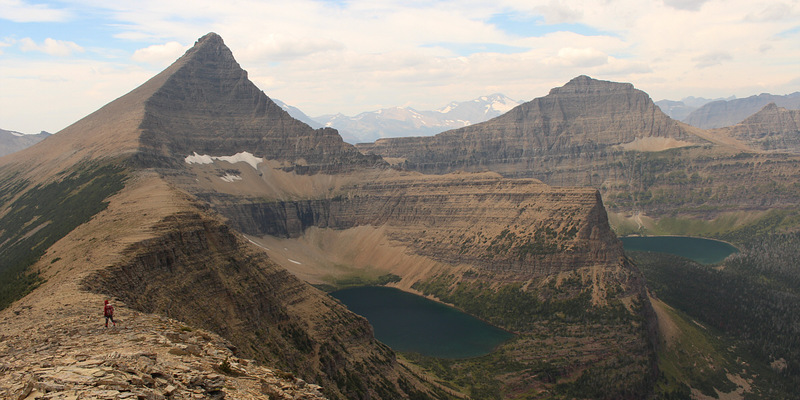 Here is a comprehensive view of Rising Wolf Mountain's west ridge. Note the trail runners on the left bump. 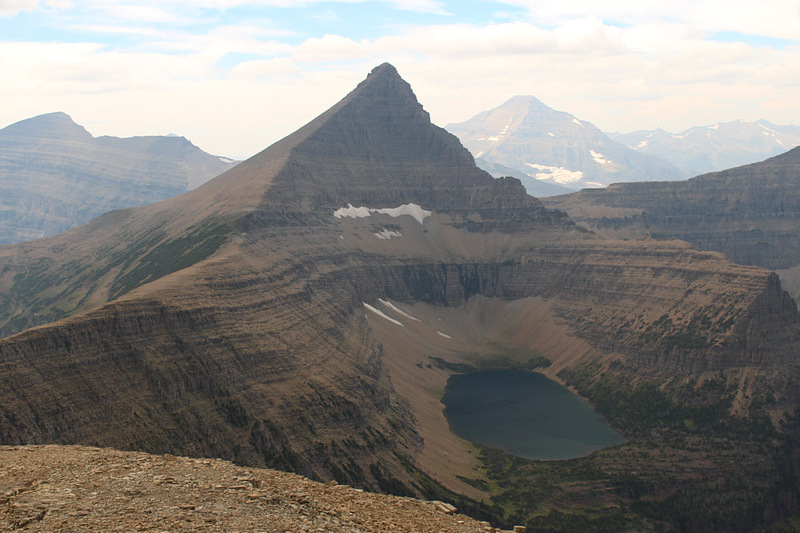 Young Man Lake and Oldman Lake sit below, respectively, Flinsch Peak and Mount Morgan. 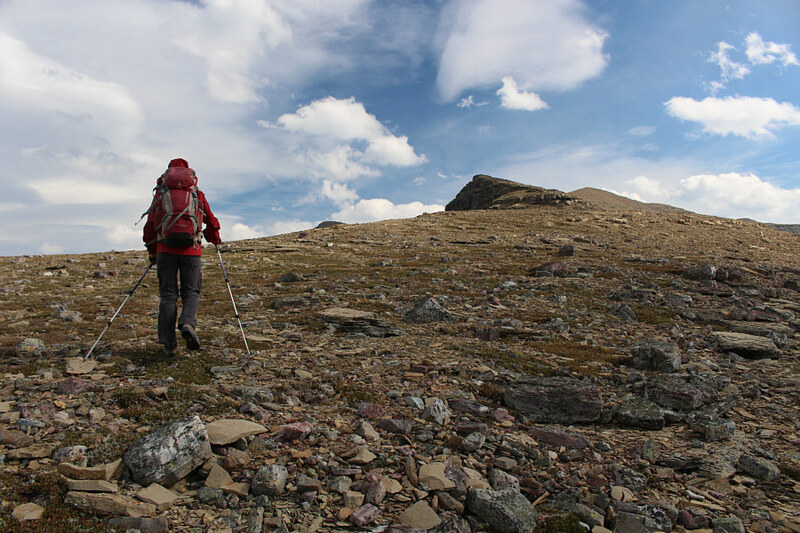 Zosia keeps marching towards Flinsch Peak. 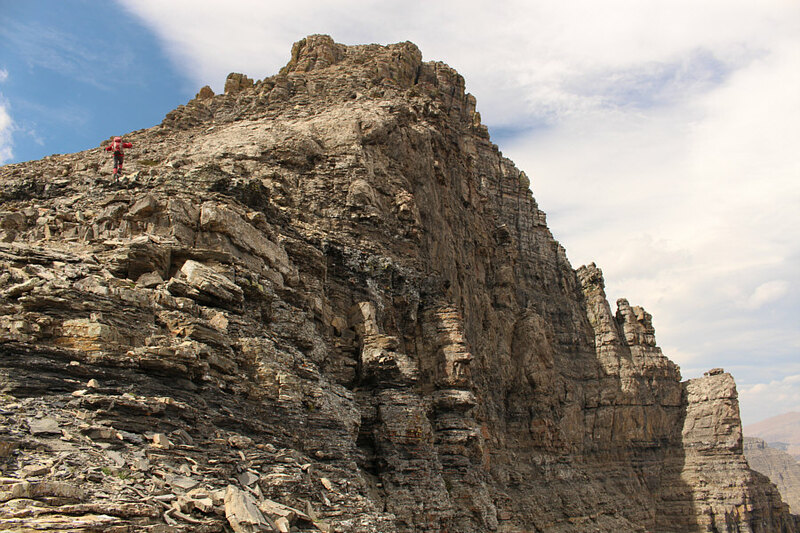 The east face of Flinsch Peak is impressive up close. 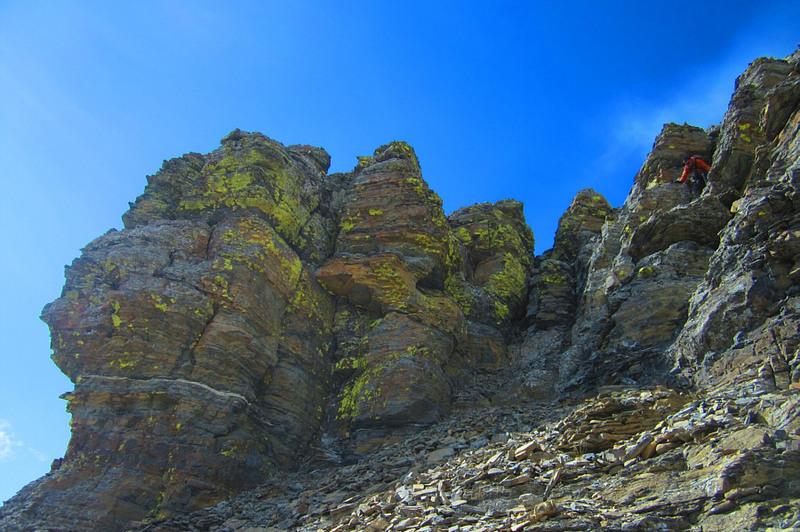 The upper part of Flinsch Peak is mostly easy to moderate scrambling. 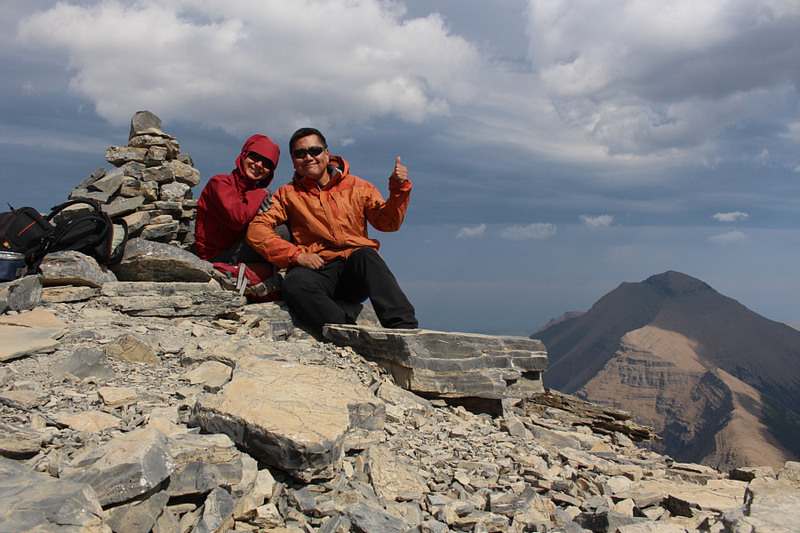 Zosia and Sonny sit beside the summit cairn on Flinsch Peak (2806 metres). Rising Wolf Mountain is visible in the distance. 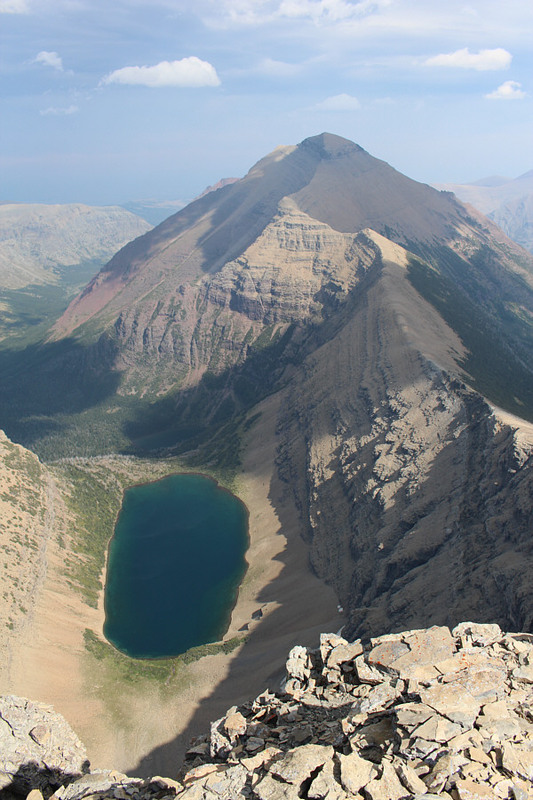 Mount Morgan and Oldman Lake garner all the attention to the north. The 'ridge' above the lake is actually Pitamakan Pass. Most of the connecting ridge to Rising Wolf Mountain is visible here. While Young Man Lake is obvious, Boy Lake is harder to discern in the shadows beyond. 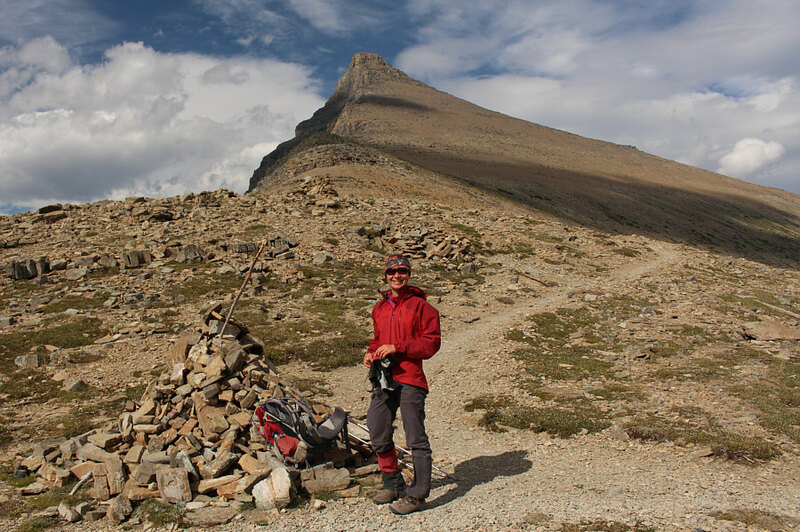 On our way up Flinsch Peak, Zosia and I noticed a lot of people coming and going near Dawson Pass, but by the time we arrived there, the pass was deserted. We stopped for another break here and debated whether or not to continue up nearby Mount Helen. We were both pretty tired at this point, and we still faced a long hike, albeit on a good trail, back to the trailhead. 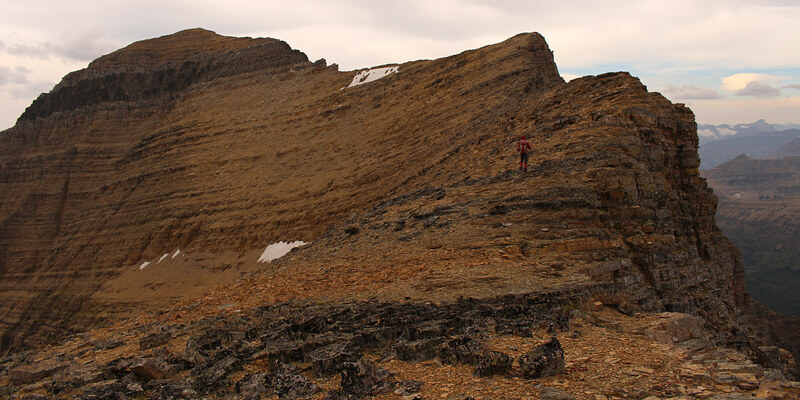 In the end, the lure of an easy summit was too hard to resist, and we promptly commenced plodding up the broad north ridge of Mount Helen. 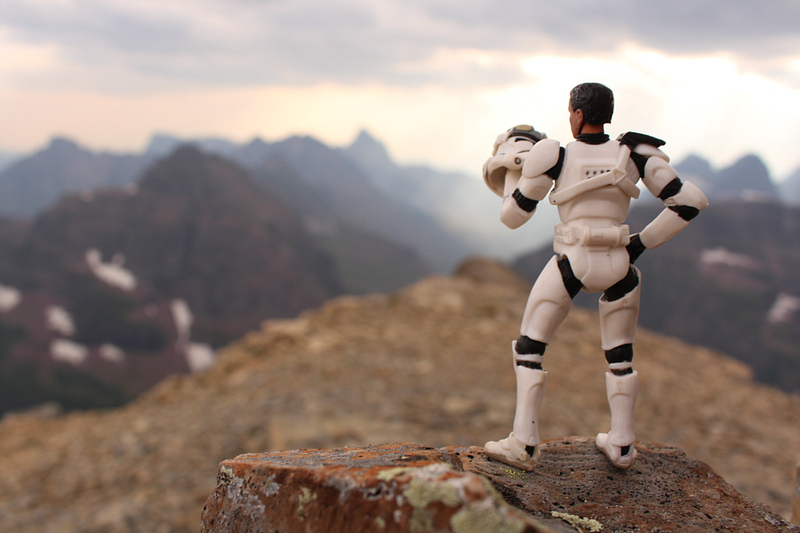 Upon reaching the summit, we noticed that the nearby eastern outlier looked almost as high if not higher. 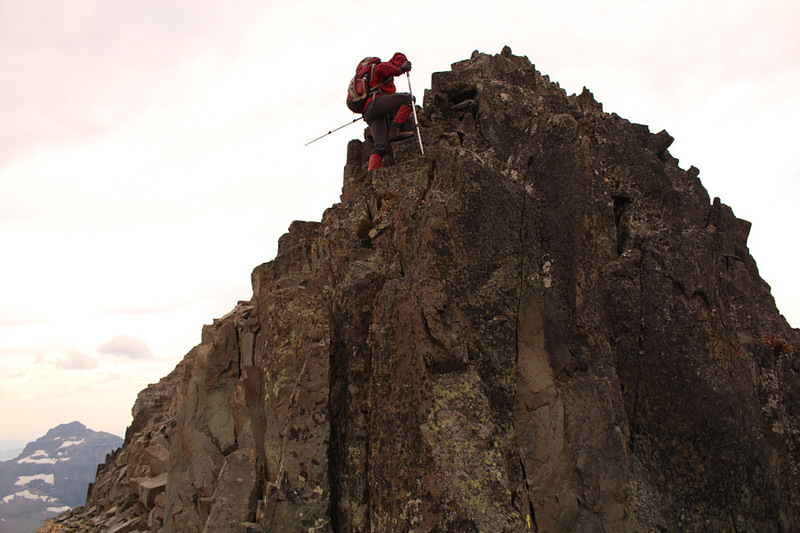 Somehow, we mustered some extra energy to hike over to the outlier only to learn that it is roughly about the same elevation or slightly lower than the true summit of Mount Helen. 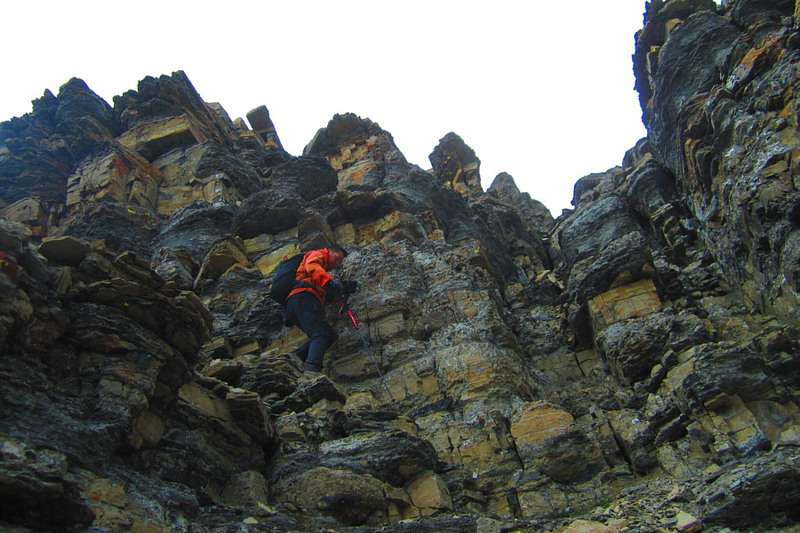 Sonny descends some lichen-covered cliffs on the southwest side of Flinsch Peak. 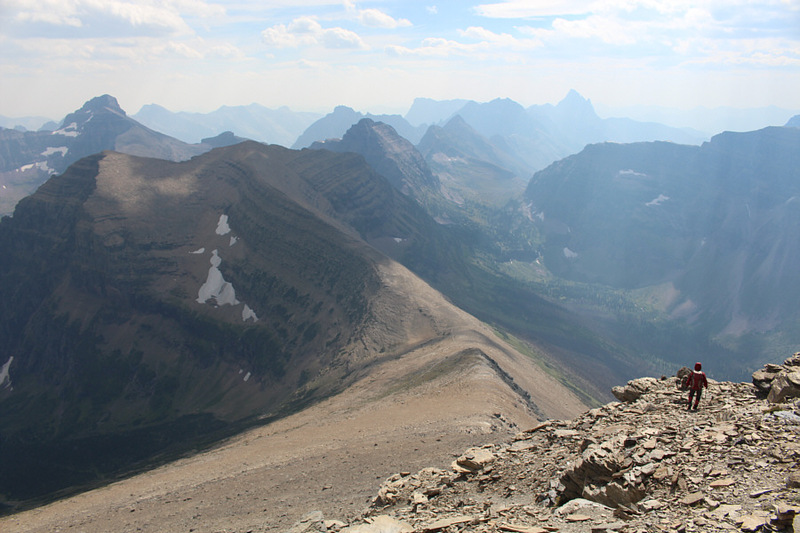 Zosia descends to Dawson Pass. At left is Mount Helen. 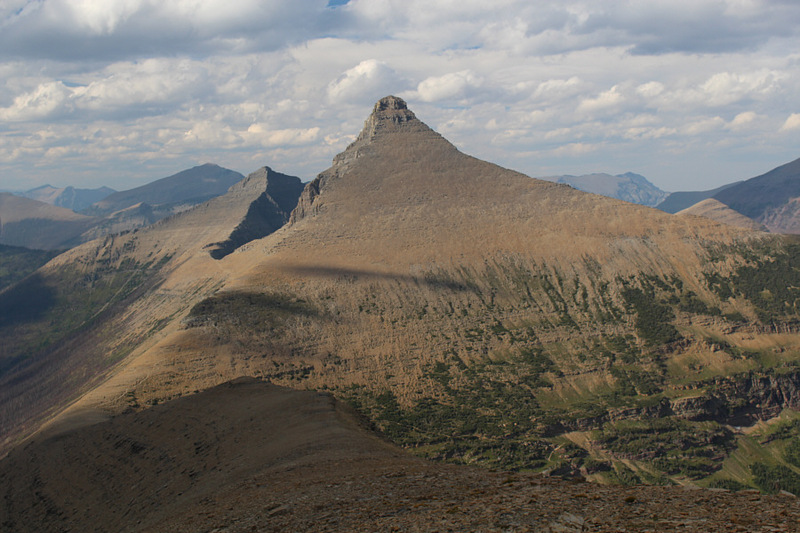 Flinsch Peak guards the north side of Dawson Pass. Zosia hikes up the north ridge of Mount Helen. Zosia and Sonny have a hard time standing up straight in the strong wind blowing over the summit of Mount Helen (2596 metres). 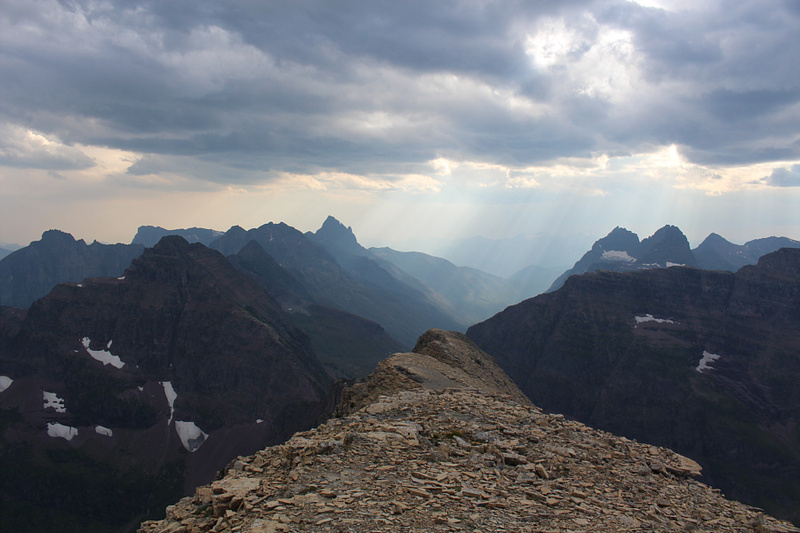 Sunbeams pierce the clouds over the peaks to the southwest. Mount Saint Nicholas is just left of centre. The great horn of Flinsch Peak rises to the north. Zosia heads to the eastern outlier of Mount Helen. At distant left is Rising Wolf Mountain. 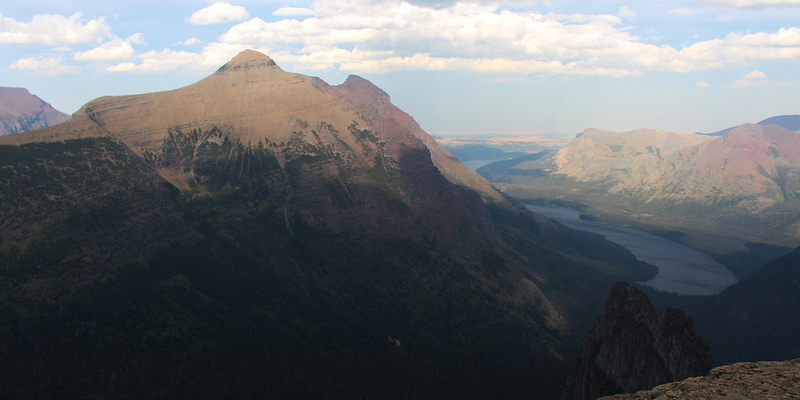 The eastern outlier grants this unobstructed view of Rising Wolf Mountain and Two Medicine Lake. At bottom right is the top of Pumpelly Pillar. This is looking back at the true summit of Mount Helen from the outlier. 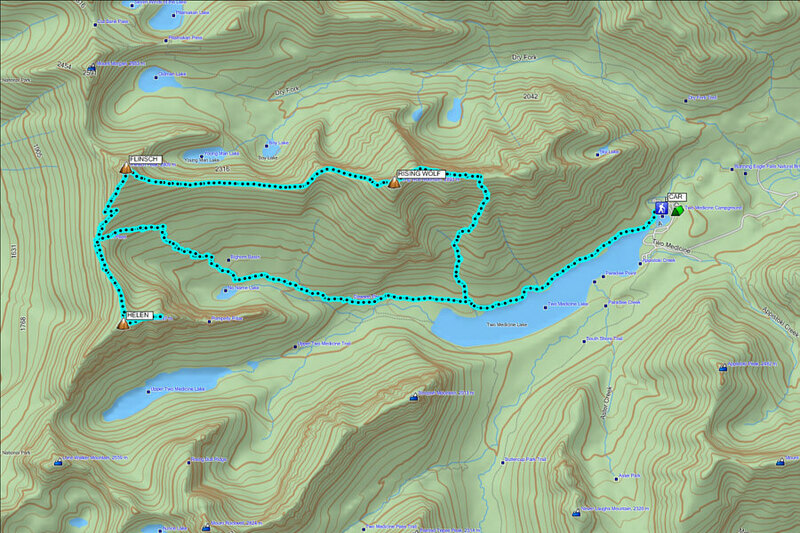 Hiking back to Dawson Pass, Zosia and I were pummelled again by a strong wind accompanied by scattered showers. 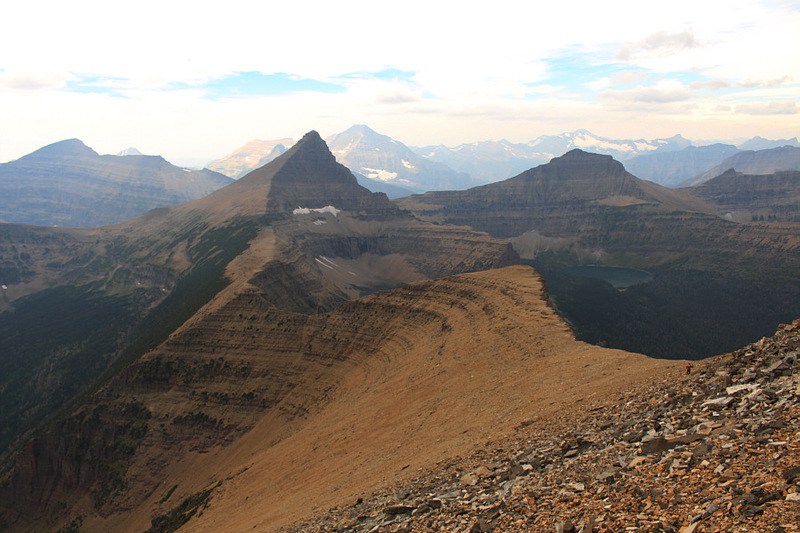 Thankfully, we were able to escape the wind once we descended the trail returning to Two Medicine Lake. 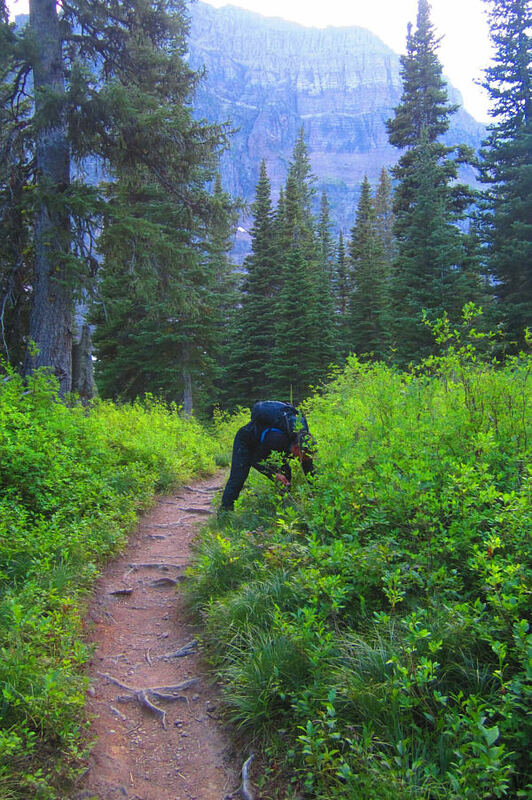 Our long hike out was made even longer when we stopped several times to gorge ourselves on ripe huckleberries. We hiked the last several kilometres in growing darkness, but the trail is smooth enough that we did not have to break out our headlamps. 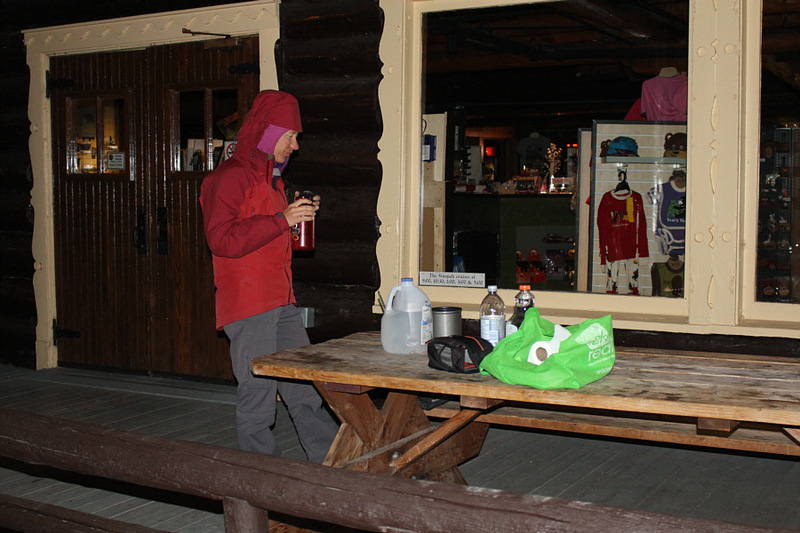 After returning to the trailhead, we cleaned ourselves up a bit at the nearby campground washroom before driving to the Two Medicine general store under a light rain. The store was already closed, but we took advantage of a sheltered picnic table on the front porch to cook and eat a very late dinner. Once dinner was wrapped up, we returned to our camping spot from the previous night to enjoy a well-deserved rest. 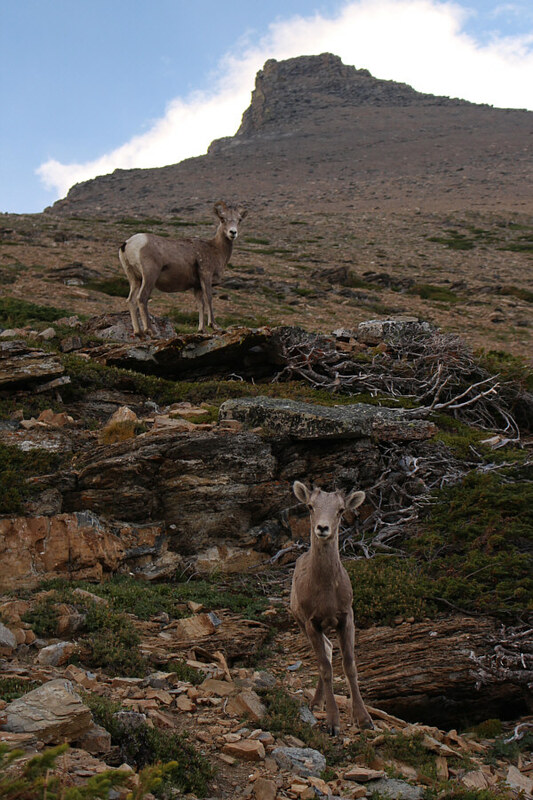 A couple of young bighorn sheep stare back at the camera on the slopes below Flinsch Peak. Sonny bends down to pick huckleberries. Zosia prepares to eat dinner on the sheltered front porch of the Two Medicine general store.